Add Fradon Lock to your Favorites and receive updates about new items and special promotions! Snugpak scorpion 3 man tent. The Scorpion 3 by Snugpak® is a new and exciting addition for Snugpak®. The first thing people will notice about the Scorpion 3 is its stylish and sleek design. This design helps the Scorpion 3 to fend off those fierce winds that kick up from time to time and still is built and designed for long term hard use. With its 5000mm PU Coated Fly it can handle large amounts of rain keeping you and your gear dry, as it should be. The Scorpion 3 has one door and three vents as well as all types of extras like internal mesh pockets, No-See-Um-Mesh, all seams are seam taped and much much more. 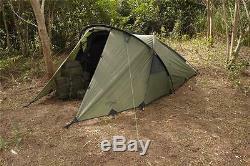 The Scorpion 3 is a Fly First pitch type tent. Flysheet is a lightweight 210t Polyester RipStop with 5000mm waterproof polyurethane coating F/R. Inner Tent constructed of 190t Nylon with Polyester Mesh F/R. Ground sheet constructed of 190t Nylon with 5000mm waterproof polyurethane coating F/R. DAC® Featherlite NSL® anodized poles with pressfit connectors. All DAC® Poles are made from TH72M aluminum. Interior Mesh Pockets (10 Total-5 on each side). 1 Doors / 3 Vents. All seams are taped sealed. Alloy Stakes (18 + 2 Spare Stakes). Available in Olive Outer/Black Inner only (pictured above). Comes with a Repair Kit-repairs can be made on the move. SHELTER WEIGHT 5.00 LBS. TRAIL WEIGHT 6.44 LBS (Fly, Inner Tent & Poles). PACK WEIGHT 7.47 LBS (Fly, Inner Tent, Poles, Stakes, Repair Kit & Carry Case). PACKSIZE 17L x 8.25D. The item "Snugpak Scorpion 3 Olive Tent Tactical DAC Poles 92880 3 Man Outdoor Camping" is in sale since Monday, March 11, 2019. This item is in the category "Sporting Goods\Outdoor Sports\Camping & Hiking\Tents & Canopies\Tents". The seller is "fradonlock" and is located in Syracuse, New York. This item can be shipped to United States, Canada, United Kingdom, Denmark, Romania, Slovakia, Bulgaria, Czech republic, Finland, Hungary, Latvia, Lithuania, Malta, Estonia, Australia, Greece, Portugal, Cyprus, Slovenia, Japan, China, Sweden, South Korea, Indonesia, Taiwan, South africa, Thailand, Belgium, France, Hong Kong, Ireland, Netherlands, Poland, Spain, Italy, Germany, Austria, Bahamas, Israel, Mexico, New Zealand, Philippines, Singapore, Switzerland, Norway, Saudi arabia, Ukraine, United arab emirates, Qatar, Kuwait, Bahrain, Croatia, Malaysia, Brazil, Chile, Colombia, Costa rica, Panama, Trinidad and tobago, Guatemala, Honduras, Jamaica, Viet nam, Uruguay.